Kylie’s ‘Aphrodite – Les Folies’ and ‘Aphrodite Live 2011’ tour commenced in Denmark on the 19th February 2011 and has travelled extensively throughout Europe before moving onto Japan, North America, Australia, South East Asia and South Africa. 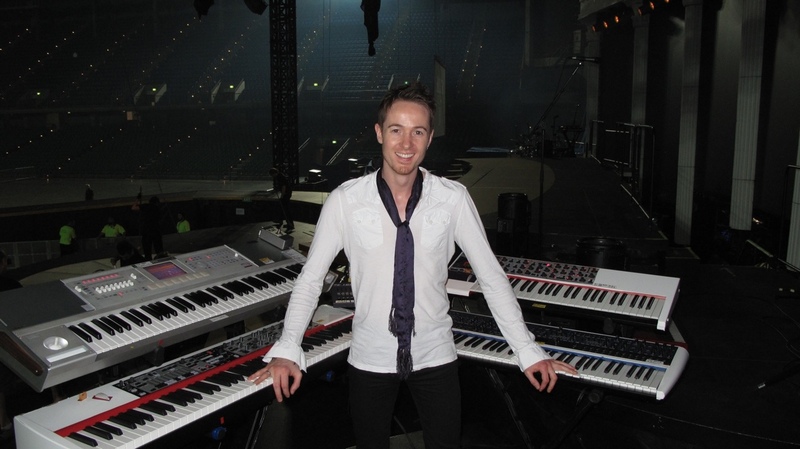 The tour's musical director, keyboard player and programmer, David Tench, is using two Nord Keyboards in his four keyboard rig - a Stage EX and Lead 3. Not that you'd instantly recognise them - the lavish production's design requirements demanded the Nord's famous red finish be shrouded in white as the band is clearly visible on the all-white stage. 'I've loved having the Nord synths in my rig,' says David. 'The Stage EX takes care of all the main piano duties. I love the fact that the effects do exactly what you want from them. Sometimes I need a grand piano with a splash of reverb for a ballad and it sounds great. However, I also love the fact that I can crunch it using compression and amp effects to give me that dirty contemporary sound when I need it. The synth section is also great for sweeping pads and little bleepy noises. David Tench is a massively experienced keyboard player and musical director. In addition to his role as MD/Keys/Programmer for the Kylie tour his CV includes Will Young (MD/Keys), Lady GaGa (Keys), Girls Aloud (MD/Keys/Programming), Spandau Ballet (Keys) Pixie Lott (Recording), James Brown (Keys), Joss Stone (keys) and much more! For more information regarding the tour please visit www.kylie.com, and for information on Nord Keyboards visit www.nordkeyboards.com and www.facebook.com/nordkeyboardsuk in the UK.